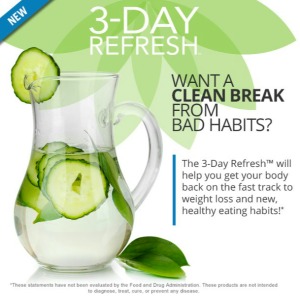 3 days to a healthier you! So what is this 3 Day Refresh, you may ask? It’s three days worth of healthy eating, cleansing, and detoxing in a healthy, moderate way that won’t tax your body and will help you to either kickstart a new fitness goal or recover from that beer and BBQ fest you just came back from. Back from vacation and let good eating habits slip? Maybe went to a party, ate too many chips and had too much alcohol and feel funky? Perhaps you’re just looking to kickstart a fitness program, or get a bit healthier and slimmer before a major event. Either way…it’s all of three days long and can help produce great results. This program will help you to shed body fat and bad habits! NO starvation! NO juice cleanses! Just healthy meals, Shakeology, and some supplements to get your body all cleansed up and ready to go. Just a great detox program that’s all of three days long and does not involve torturing yourself in any way, shape, or form! It is now available and there is a challenge pack sale for the month of July! Yes, it IS vegan and you can choose either vegan or whey protein based Shakeology upon checkout. And YES, there is a money-back guarantee! You have nothing to lose but excuses, post-bad food and drink ickiness, and obstacles holding you back from your goals. Posted on July 22, 2014, in Diet, Fitness, Health, Shakeology and tagged 3 Day Refresh, cleanse, cleanse diets, cleanses, detox diets, detoxes, diet, diets, eating clean, eating healthy, fitness coaching, food, great deals, health, plant based diet, quick weight loss, Shakeology, Shakeology cleanse, weight loss. Bookmark the permalink. 8191 Commenthttp%3A%2F%2Fwww.teaaddictedgeek.com%2F%3Fp%3D8193+days+to+a+healthier+you%212014-07-22+14%3A30%3A57Andrea+Bermanhttp%3A%2F%2Fwww.teaaddictedgeek.com%2F%3Fp%3D819. Mine is sitting on my shelf! 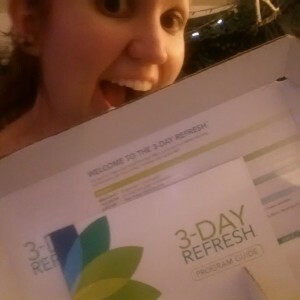 I was waiting until the end of my recent round of 21 Day Fix to start, but I forgot about it!